We haven't seen new Bagle attacks in a while. The last one – and even that was an isolated one – was exactly a month ago. But now somethings up. Some of the old Bagle update URLs activated tonight, offering a new 188kB executable. This is downloaded and run by machines infected by previous Bagle variants… and it starts to spam out infected attachments with filenames talking about price lists. 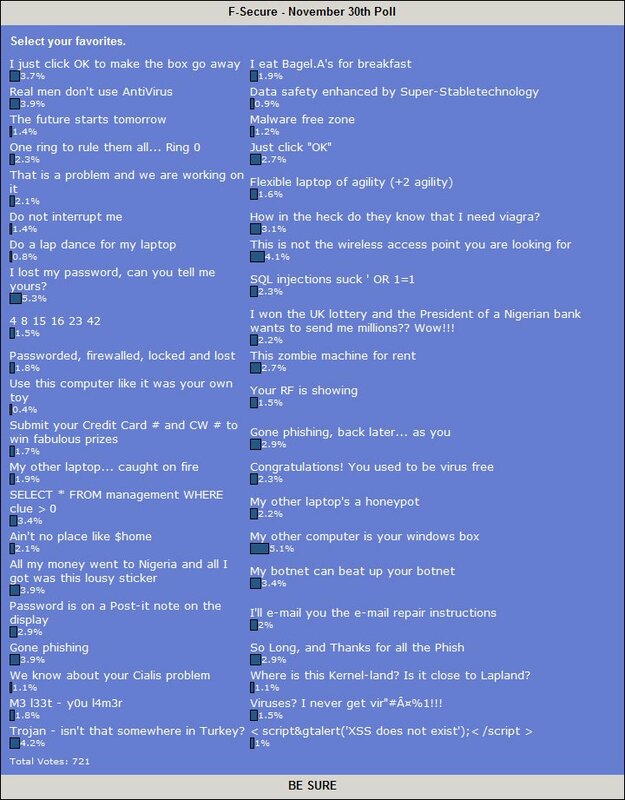 The spammed e-mails include a GIF which shows a password needed to decode the ZIP files. This new Bagle also uses an SSDT rootkit to hide its presence on an infected system. Administrators: You might want to check your firewall logs for suspicious activity to www.bronko-m.ru and bpsbillboards.com… and block future access to them. We've added detection of this variant as W32/Bagle.GO. We gave away free laptop stickers back in March. Now we're going to order some more and we'd like your opinion. Take the poll, select your favorite(s), and/or make a suggestion. The submissions that we like the most will get some of the new stickers. Include an e-mail address in the text field so we'll know how to contact you. Cheers. Got a USB stick as a gift. At least according to the documentation, it supports rooting from BIOS! It also has "encrupted" support and Super-Stabletechnology… neat! We've been busy with the latest spam runs of the Warezov family over the last hours. Updated to add: New domain - RXFF - See the list. 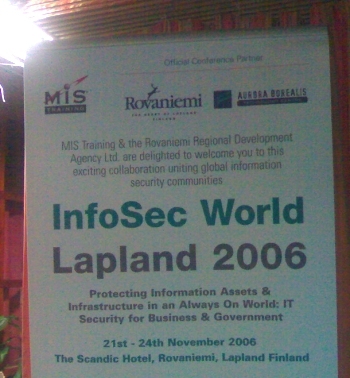 I've today been keynoting at the Infosecurity Lapland conference, which was held in Rovaniemi, Finland. Around 90 experts from all parts of Europe have spent a few days discussing the state of data security and should we care about it or not. Did you know that the laptop was invented in Lapland? 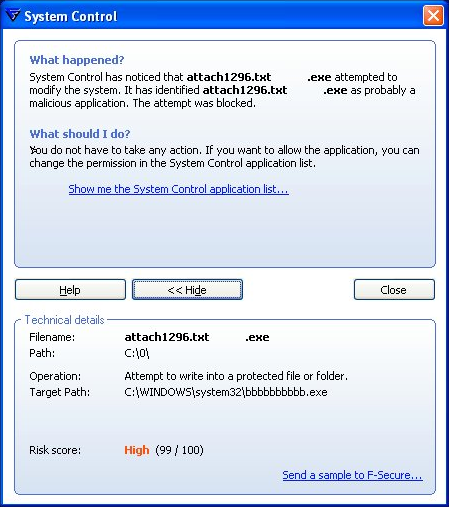 We recently received a proof-of-concept sample of an adware program. Normally that wouldn't be worth blogging about, but in this case it's for Mac OS X. In theory, this program could be silently installed to your User account and hooked to each application you use… and it doesn't require Administrator rights to do so. We won't disclose the exact technique used here, it's a feature not a bug, but let's just say that installing a System Library shouldn't be allowed without prompting the user. Especially as it only requires Copy permissions. An Admin could install this globally to all users. The result: This particular sample successfully launched the Mac's Web browser when we used any of a number of applications. This is easier to do than with Windows. After all, it's a Mac. The Weblog has received several requests from readers for a list of Warezov domains so that they could be blocked on their networks. We have posted on the topic many times and have typically included screenshots with the details, but not always something that could be copied and pasted. And these are kind of odd names… so it's easy to make a typo when typing them yourself. This is at the moment, the only link to the page, so bookmark it. Note that most of the domains listed are presently offline. Perhaps we could collect other information for our readers in a similar fashion? Is there anything else that you have been copying from our content? Please submit your comments to the address listed at the top of the Weblog's homepage. Did you laugh today? If you are getting as many new Warezov samples as we do, probably not. But I did just for a second or two when we took over the shift from our Kuala Lumpur Response Lab and they had added the latest new Warezov variants including — Warezov.HA — the 209th variant. Then I realized that we won't be laughing when the .HAHA variant arrives. There will be more information on the domain names used by this worm from Sean shortly. Those who want our current list of the domains to block, stay tuned! Here's a video, showing the symptoms of the "Grey Goo" ring attack on the Second Life online multiplayer game last weekend. Shot by Amulius. Second Life, an online multiplayer game, has recently been targeted with self-replicating scripts, written with the Linden Scripting Language. Apparently there was a pretty bad attack last weekend, shutting down the game and leaving valid users still without script support. This "Grey Goo" attack was visible to the players of the game as it scattered revolving golden rings around. More from the official Linden Blog. Sysinternals has made available a great new tool called Procmon that combines the features of two older Sysinternals utilities: Filemon and Regmon, and adds much more. You can use this tool to monitor very closely what's happening on a system, as it happens. support for each operation, simultaneous logging to a file, and much more. 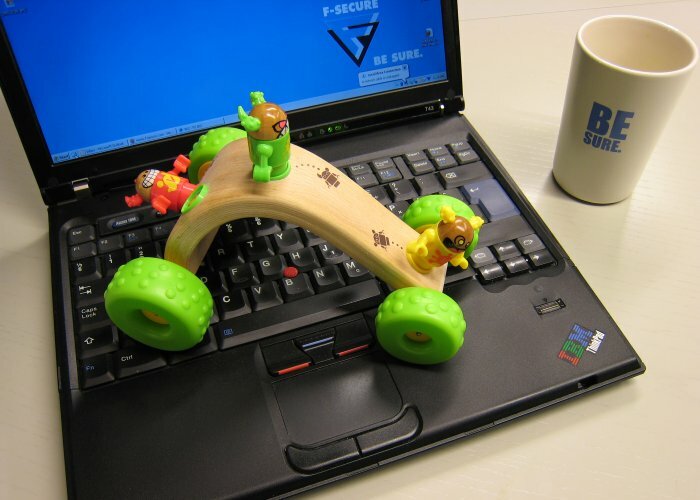 your system troubleshooting and malware hunting toolkit." Updated to add: There's been some reports of system crashes while using Procman. See the discussion here. We've seen no problems ourselves but your mileage, as usual, may vary. 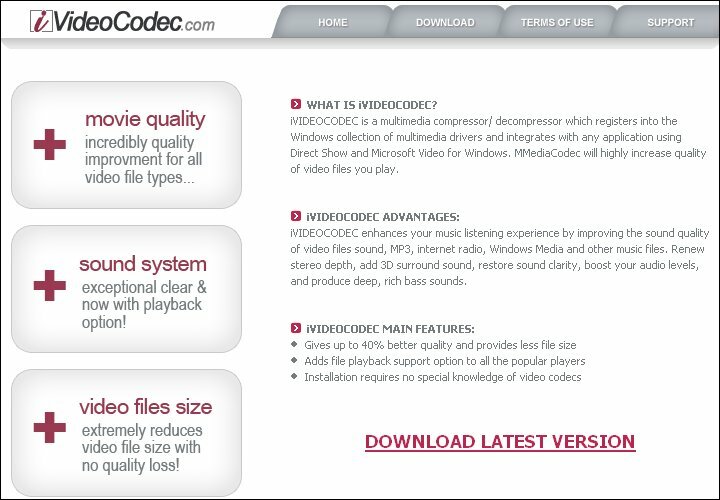 While browsing the Internet for movies – *cough* pr0n – people often end up downloading some DRM protected material, bundled with a license that uses social engineering tactics to push the victim into dowloading a "codec". These supposed codecs are downloading and installing malware known as Zlob. 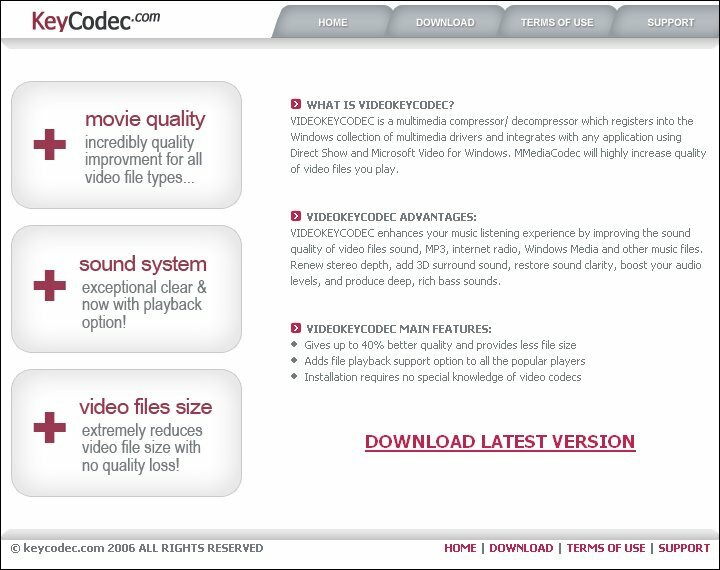 Right now, all of these sites (keycodec, ivideocodec, jpegencoder, lightcodec, elitecodec, qualitycodec, et cetera) default to using a filename of "FakeCodec.107.exe". So currently, fake codecs with the number 107 in their name should be an easy tell to avoid. However, when an affiliate pushes one of these sites, the filename number might also change to reflect his ID. Sunbelt's blog frequently posts fake codec site URL's to avoid. Good Guys. Kurt Wismer also has some good advice: Get a good media player that handles multiple formats, and then be very suspicious of anything else prompting you for a new codec. 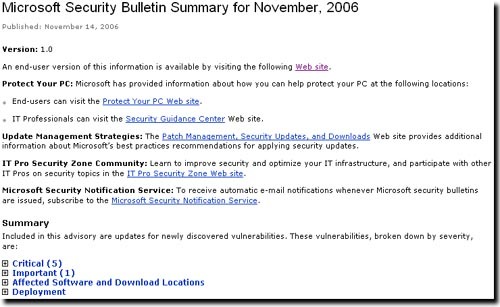 The Virus Bulletin 2006 conference website has been updated with the official conference report, several interesting slide sets from the presenters, as well as tons of photos. Check it out at http://www.virusbtn.com/conference/vb2006/index. 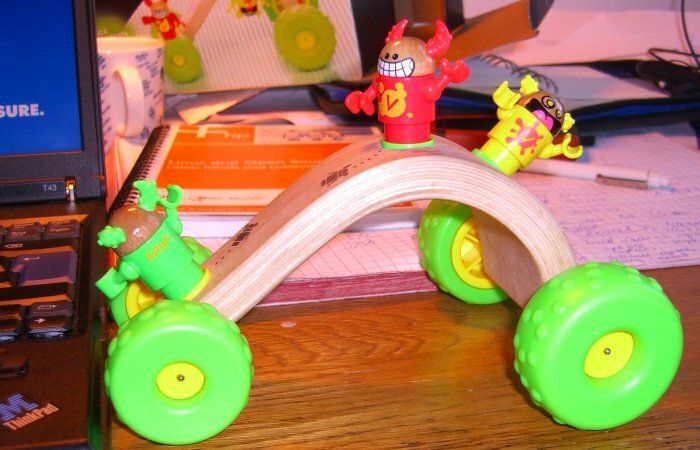 Brio, a Swedish toy manufacturer that specializes in wooden toys, has a new product. Viruses! The Viruses are part of their "Brio Network" collection. Along with product info, Brio's site also includes a virus download aka active desktop, and a movie. We think they're pretty cool. Unfortunately, the ones pictured above belong to someone else — Mari from Marketing. Or rather, they belong to her son. So we'll just have to get our own. As was recently disclosed, the Warezov operation is largely to blame for the massive increase in spam amounts. Warezov-infected machines download additional components which, after a variable delay, start sending out spam messages. All of these spams (as far as we've seen) are pharmaceuticals spams, advertising Viagra, Vialis, Valium, and Xanax clones. You can make the connection between the virus and the spam just by looking at the domain names used by the Warezov gang for both the virus component download and for the hosting of the fake Viagra sites. 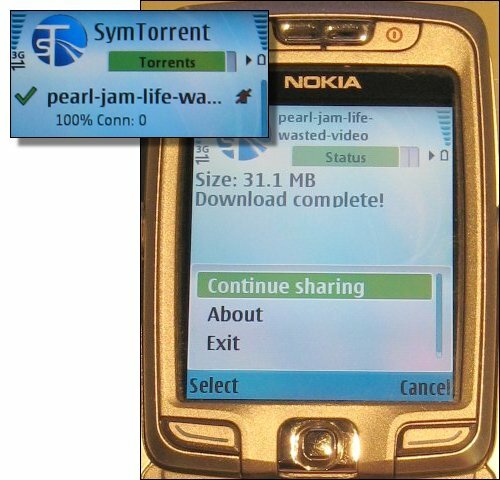 Warezov is spread by spamming slightly modified versions of the downloader component. This is modified by the spammers as soon as major antiviruses add detection for that particular component. We believe the Warezov gang is using services such as Virustotal or Jotti to monitor the reactions of the antivirus industry. 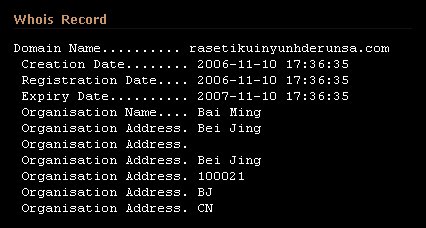 When we look at the whois information of these domains, we see that not only do these domains have similar sounding names but we can also categorize them to just three different groups: domains registered to "Wang Pang", "Dima Li" or "Bai Ming". The Warezov operation started in the middle of August 2006 and continues to this day. 1) No, we don't know if these domain names mean something in some language. 2) The case is under police investigation. Sadly well known among Italian computer users, "Gromozon" is a complex collection of malware that feature rootkit techniques, anti-debugging tricks, and more in order to perform its vicious activities. We detect this collection by many names such as Trojan.Win32.Obfuscated.a or Trojan.Win32.Agent.rk. At this point you're probably thinking - So, this is rather typical when it comes to really nasty malware, what's the reason behind this particular blog entry? Well, it seems that the war between Gromozon's authors and security researchers at Prevx has reached a new level - It's personal now. After being utterly frustrated by the inability to bypass Prevx's dedicated disinfection tool, Gromozon's authors decided to attack on another front. In the latest variants of Gromozon, whenever an analysis tool, such as our F-Secure BlackLight, or more generically a "banned" application is detected, the malware itself will present the user with a lovely message that leads him to believe that the source behind the malware are the guys from Prevx, and especially Marco Giuliani - one of the first security researchers to study Gromozon in depth and to provide a disinfection tool. Of course, Prevx and Marco Giuliani have nothing to do with the malware. On the contrary, they are active members of the community that struggles everyday for computer users' safety. From November 2nd: Wired News - Uncover DHS' Virus Gaffe. 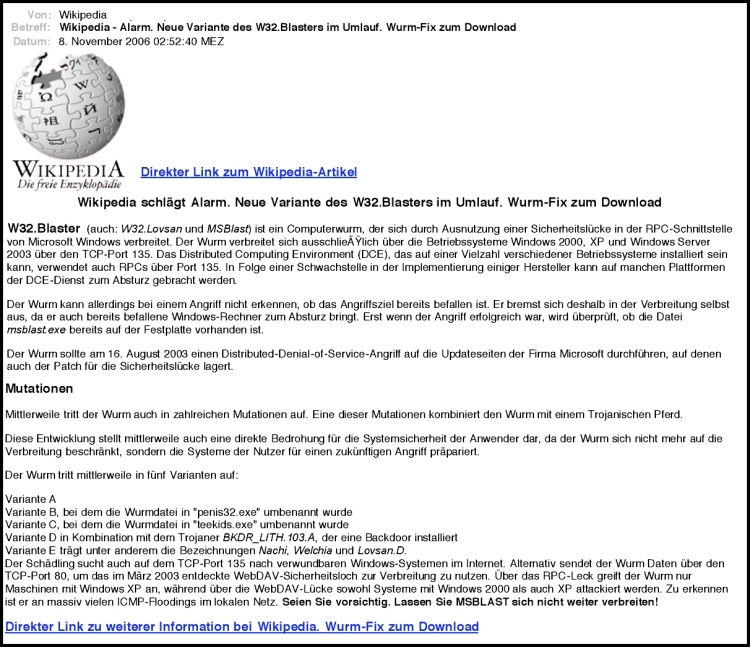 Two days ago, the German version of Wikipedia was targeted in an attack where the encyclopedia entry for the Blaster worm was modified to include download links for a fake patch. If you followed the links and installed the patch, you got hit with a trojan instead. If you follow the links in the e-mail, you'll end up on a Wikipedia lookalike page at "wikipedia-download.org" which is actually running on a server named "h4serv.webhostingoutsourcing.com". Interestingly, the download (which we block as Trojan-Dropper.Win32.Small.atq) actually installs the original patch from Microsoft - and then drops a trojan. Nice. The rogue domain "wikipedia-download.org" has nothing to do with real Wikipedia. However, it has been registered with exactly the same registration information as the real wikipedia.org domain. While the real Wikipedia is registered to St. Petersburg, Florida in the USA, the IP Address of the fake site is located in St. Petersburg, Russia. Zango and the USA's Federal Trade Commission (FTC) reached a settlement last Friday. Zango agreed to pay the FTC $3 million. The agreement also contains language strongly clarifying what is required as consent from installers of Zango's software. See Part V in this PDF. But it raises the question: Isn't trying to manage such affiliates like cat-herding? November 6th: Websense reports "Fradulent YouTube video on MySpace installing Zango Cash". Warezov continues its seemingly endless run, and we continue to add detections apace. Detection for Warezov.DG was added on October 20th, and today, we added detection for Warezov.GL with database 2006-11-07_04. It's a very busy little bugger and the subject of many unkind words among the researchers. 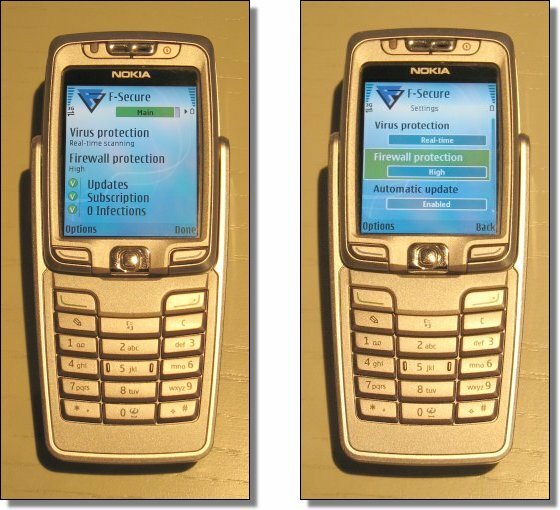 So, Alexey was curious and tested the GL variant against F-Secure Internet Security 2007's System Control feature. (As we did with the beta). The results were very pleasing: Warezov is still automatically denied and blocked by System Control. 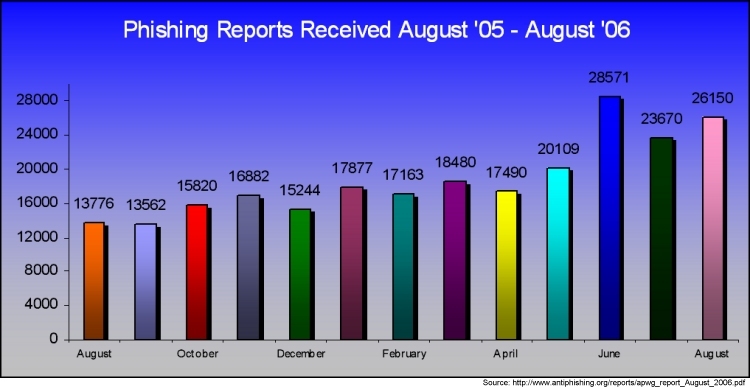 Phishtank, a service run by the good folks at OpenDNS, have published their first set of phishing statistics. Interesting stuff, showing that Paypal and eBay continue to be the most targeted organizations in phishing attacks, but some German banks are climbing up the scales. Other sources of phishing stats: Netcraft, Ciphertrust and APWG [PDF]. Last Friday Thierry Zoller and Kevin Finistere gave a presentation in the Hack.lu 2006 conference on Bluetooth issues. They also showed a demo of BTCrack, a Windows tool that can crack Bluetooth PIN and Linkkey in almost real-time (assuming it has sniffed the initial pairing).